With the historic storm Jonas past our area, I thought I would post a few pictures for posterity. One of these was in my last post, but I’ll include it here as well to keep the images together. This first picture shows the hives before the storm. It was below freezing so the bees were likely clustered up and working their muscles to keep their queen and sisters warm. The following is the shot from the prior post, about four hours after the snow started falling on Friday afternoon. Almost exactly 24 hours after the prior shot the snow was still falling. I braved the wind and snow to snap the following picture. According to my temperature sensors, the top of the two Langstroth hives were around 43 degrees (F), or 15 degrees above the outside temperature. So the bees were snug and warm. The next morning brought a sunny day, with the birds singing and snow everywhere. Our neighbor thankfully cleared our driveway with his tractor, and we were able to dig my lovely wife’s car out from under the snow. My little Toyota Prius is still buried, a task for tomorrow perhaps. 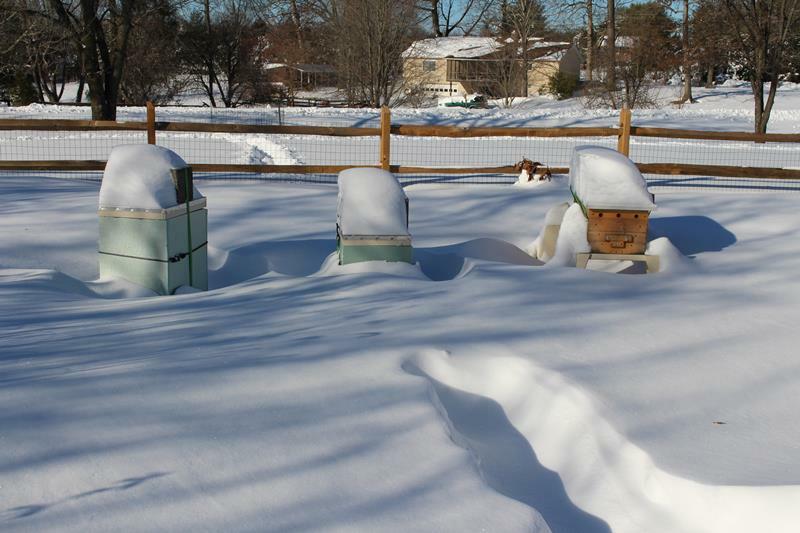 Here is a final shot of the hives this morning, well insulated in many layers of snow. You may recall that I put a horse trough heater in my little pond to keep the fish above freezing. This continues to work well, and in the storm the snow piled up around the side of the 30-gallon tub. Here is a picture of the pond Sunday morning with the hives in the background. You can really see the depth of the snow in this shot. I’ll finish with a picture of the back of our hive Jupiter. As the shortest of the hives, I wondered if this might be completely hidden in snow. 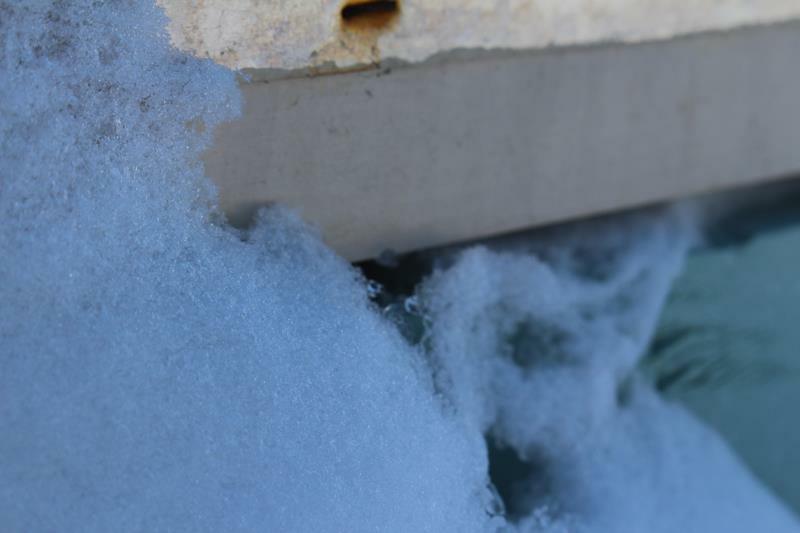 It was covered in the back, and here you can just see that the heat of the hive has melted the snow outside the top exit. In fact there were two bees on the snow that must have exited to die outside the hive (they do that to spare their sisters the trouble). This week is predicted to have above freezing daytime temperatures, with a chance of rain on Tuesday. We’ll see how long this snow lasts. Stay clustered up and warm out there! I first heard of the white bees from a post by Emma on Miss Apis Mellifera. They are part of the fairy tale The Snow Queen written by Hans Christian Andersen. The tale is about two friends, a girl Greda and boy Kay. Kay loses the ability to perceive goodness in the world, and Greda travels to the castle of the Snow Queen to save him. The full text of the tale is online, or there are a few different versions of the book available. This fairy tale was the original source for Walt Disney’s movie Frozen, the animated 2013 film. The final plot of the film is quite different from the original story, although the message that love conquers all remains the same. When I thought about bees in wintery snow, Emma’s post came to mind. I had to look it up to recall the tale, and I considered titling the post “The Snow Queen.” In the end the post is about whiteness and bees, so the current title won out. Surreal to see your photos and hear that your wife’s car was buried under the snow. Happy that the bees are ok in there. Thanks Emily. Pretty crazy weather for us. 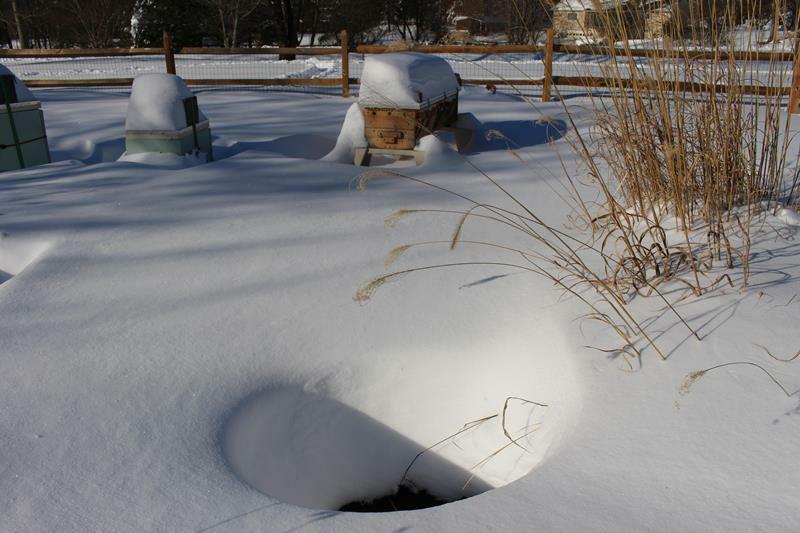 The snow is great insulation for the bees, but no fun for you! Good luck digging out your car! That photo of the fish pond is something else! Actually I enjoy a big snowfall every year or two. it’s pretty and a bit of fun. The neighbors had an ATV out and pulled a sled up and down our little street. Good times. I freed the back of my car today and climbed through to the front seat where I was able to back it up a few feet. Then I was able to shovel my way to the door. So the car is free! Thank you, Emma, I appreciate the warm thoughts. We’ve made it to February, which I hear is often the toughest month. I’ve been travelling all week so looking forward to seeing the status of the hives this weekend. Ah, thank you Cecilia. There are a few beekeeper groups in Illinois if you ever wanted to try again (check out http://www.michiganbees.org/about/clubs). I’m sure they’d have overwintering advice for your area. This is my first winter so still crossing my fingers. The pond is nice, but the bees much prefer the neighbor’s pond across the street. It’s bigger and older so probably has better minerals. I’m hoping to redo the pond this year to see if I can get the bees to use it more often.